So, Renault have successfully played their "Get Out of Jail Free" card, and essentially escaped punishment for colluding with Nelson Piquet Junior to deliberately crash his car during last year's Singapore Grand Prix. Flavio Briatore has paid the ultimate price for the Renault race-fixing scandal. Is anyone surprised that the FIA let them off with nothing more than a rap on the knuckles? Not me. The sport's governing body is in a precarious position after this year's shenanigans with the Formula One Teams Association ( FOTA), who almost took their toys away and left them with no Formula One Championship to govern. Little wonder then that Max Mosley and his buddies trod very carefully when it came to the issue of sanctions, lest they upset the golden geese. Of course, some people will feel justice has been done, because former Renault team boss, Flavio Briatore, and the team's ex-engineering director, Pat Symonds, pulled a mea culpa and fell on their swords. However, while I agree that the two main offenders suffered for their actions, it was only after initially denying the claims, and after admitting that their confessions were an attempt to gain leniency for their former employers. I think they call that a plea bargain, don't they? And does anyone think a plea bargained sentence feels like justice? Furthermore, I may be cynical, but it stretches the bounds of credibility to believe that Briatore and Symonds acted alone. Judging by all the layers every other decision has to go through in Formula One, it just seems unlikely that the two men could have acted unilaterally without at least someone on the Renault team becoming aware. After all, there are few more collaborative team sports than Formula One. And even if by some freak set of circumstances nobody knew about the plot besides Briatore and Symonds, what happened to the - no "I" in team mantra? According to Max Mosley, Renault bore "no moral responsibility for what took place." But surely there was guilt by association? I mean, when a bunch of hooligans cause trouble at a football match, the club is often sanctioned for failing to control its supporters even though the trouble-makers are not in their employ. How much more responsibility should you bear then, if the guilty parties are your hires acting in the interests of your team? Finally, what about the driver at the center of the case? Nelson Piquet Junior agreed to crash his car and had kept quiet about doing so until he was fired. So while the FIA has lauded him for his co-operation, I can't see how that praise is warranted as his confession was self serving, designed purely to get back at the team that sacked him. Of course, his punishment is that he may well have driven his last Formula One race, as who would want to employ someone with such questionable integrity? Still, it would surely have been more appropriate to see him punished as a direct result of F1's justice system, not just as a by-product of it. And so another sad and sordid chapter in the Formula One saga comes to an end in a somewhat unsatisfying manner. Was justice done? Barely. Was the punishment prohibitive, making it too costly for others to take a similar gamble? No!...Do we have closure? Negative, because no-one involved with Briatore is allowed to be associated with Formula One, and he's the manager of Renault's Fernando Alonso and Red Bull's Mark Webber, and also has connections with McLaren's Heikki Kovalainen. So there's another minefield waiting to be trodden. All in the all then, not a happy outcome for anyone but Renault, and a pretty miserable state of affairs at a time when we should be looking forward to the climax of the season. I totally agree with Terry! What happened at Renault is a shame and gives another blow to this sport. As for Renault, they show no regard for sportsmenship, regulations, and ultimately humain life. If this is the type of company culture they have, I am sure I do not want to encourage it by buying any of their products. And it is decissions like this one by FIA that will ultimately ruin the sport and drive the fans away. It makes me sick. Terry Baddoo is off the track. 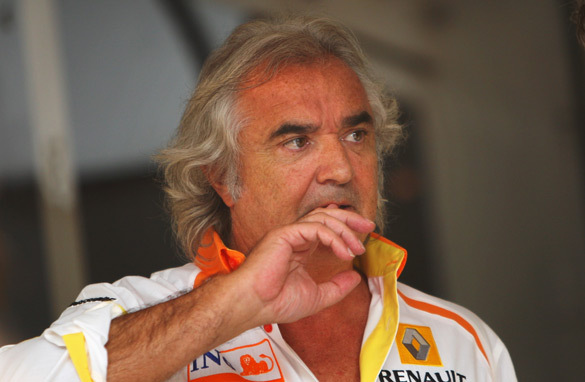 There's no evidence that Renault condoned Briatore's action or created an atmosphere that promoted his reprehensible behavior. While I agree that Nelson Piquet Jr. deserved no praise for his cooperation, he is no longer driving in F1 and there's little chance he will ever have the opportunity again. He's not just a creep and a whiner, he's a lousy driver. Baddoo is wrong that Briatore and Symonds could not have acted unilaterally or without the knowledge of others. Even in F1, private communications can take place privately. It's time for Mosely and Ecclestone to move on, but Formula One should not be tarred and feathered because of the acts of a handful of sleazebags. Most F1 competitors are outstanding individuals with high ethical standards. Look at the field: Vettel, Fisichella, Massa, Webber, Hamilton, Barrichello, Button, Heidfeld, Glock, Trulli, et al. You won't find a better bunch of competitors in ANY sport. With a slate of underdog teams and fine, principled drivers vying for the championship, perhaps Terry Baddoo isn't looking forward to the climax of the season, but I and millions of others certainly are. If Flavio and Pat were wrong and now punished (which feels right), then Nelsinho should certianly be on that list as well (he 'pulled the trigger'). Piquet is not a racing driver, no racing driver would crash on purpose. A racing driver races to win. He should be banned from all motorsport for endangering the life of so many, it doesn't matter what the boss tells you on the radio, if he tells you to crash into a wall at 300 km/h you do it? NO because that could kill you.He should only be allowed to race his lawn motor in his backyard. Briatore and Symonds have been put aside just to show that Renault gives a damn about what happened, but the truth is they just don't want penalties, even a fine(like McLaren had) I think would make Renault walk away from F1an nobody wants to see Renault out of F1, and you are right about FIA to be afraid in some way of FOTA because after all FOTA makes the show. Nelson Piquet jr. should also be punished. A) If he had stayed on with Renault he would have kept his silence, and B) told to or not, he deliberately crashed the car!! If the duals (Flavio Biatore & Pat Symonds) are hooked why dont the team itself. Does their 'employment clause' stated that their action are not the team liabilty? So whose action are really implies the team credibility then? The owner himself? Lets me think... no, I dont think so. Renault should be banned from the Constructors Championship and loose all points this year. Good for McLaren = good for Renault. Alonso should have the win taken away since it was a team manufactured win. What I want to know is how deeply did this "investigation" actually go? Who knew and when did they know it. Did Alsonso know? If so, when? Too many questions and people to look at. Flavio and Symonds took the fall. Finally, don't blame Piquet Jr to hard. While he had the choice to not do as he was told I bet he feared the repercussions if he didn't. While it is an Integrity issue, very few people choose the high road when placed in a situation like this. Happens everyday in the Gov't and Commercial businesses and this situation is the exact reason the "Whistleblower" Act was created. a) Since when is fixing a race less of an an infraction than spying on another team? What hypocrisy; the lack of punishment was totally about not having Renault walk away from the sport. b) How many drivers in F1 have the stature to disobey orders from their team director? Have we all so quickly forgotten that earlier in this season, the reigning world champion was told to lie to the stewards, and did so without hesitation? c) I find it highly unlikely, given the amount of coordination and communication required for a successful F1 operation, that Briatore and Symonds would not share such a critical strategic decision with the rest of their team. what worse could a team do than cheating on everybody, bringing everyone (driver+audience) in serious danger? this is such a shame... with this unmoral decision formula one is dead to me. and by the way nelson piquet jr. is an idiot, he should never be involved in motorsports again. I am from Singapore. And hence, I watch this episode closely. Sure, it is a breach of ethic. No doubt. While some passionate viewers are watching F1 as a sport, I can't help to look at it more like a show biz. The glamor, the sponsorship, and all. Personally I would agree with Massa that the Singapore race should be voided. That would make him the 2008 champion of course. But that is only fair. The question is, why doesn't the F1 organizer recognizes that the race was manipulated and the result be voided like other sports? Of course there is an unspoken mantra that "anything can happen in F1". So, sounds to me that "anything" would involve cheating. The impact is so far fetched that I am not so sure where should the "punishment" stops.